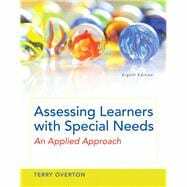 Assessing Learners with Special Needs: An Applied Approach, 8/e provides readers with a practical, step-by-step approach to learning about the complex procedures of the assessment process. This new edition provides a new presentation format and a new format for assessing student mastery of material through interactive learning activities. The Enhanced Pearson eText features embedded video, assessments, and exercises. Terry Overton has experience as a special education classroom teacher, educational diagnostician, and consults with school districts regularly as a Nationally Certified School Psychologist. She conducts research in the area of autism spectrum disorders and assessment and she continues to provide professional development to school districts to assist with the implementation of RTI models.